PC use, landline phones and paid TV service subscriptions are on thewane as consumers gravitate toward mobile devices and free content, anew KPMG study of global convergence trends shows. PCs are still more popular thanmobile devices for Web browsing, favoured by 86 per cent of peopleglobally and 91 per cent of Canadians. But many activitiestraditionally performed on PCs – including Web surfing, online bankingand watching television – are increasingly being done on tablets andsmartphones, the report suggests. Tablets in particular are quicklygaining ground. 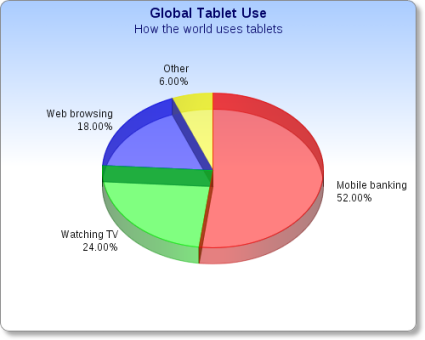 The study shows 24 per cent of people surveyed globallyuse tablets to watch TV, 52 per cent use tablets for mobile banking,and 18 per cent use tablets to browse the Web. This is the first yeartablets have been included in the study, which began in 2006 and thisyear surveyed 9,600 people around the world (300 of them in Canada) in32 countries including the U.S., China, Ireland, Australia and Nigeria. “I don’t think the data’s conclusive at this point to indicate thedeath of the PC but (tablet use) is definitely having an impact,” saysYvon Audette, a partner and service line leader for IT advisoryservices at KPMG Canada’s management consulting practice. Forty-nine per cent of Canadians now have a smartphone, which is below theglobal average of 55 per cent. Yet the smartphones, even more thantablets, are the main force driving the trend away from PCs, Audettesays. “The ubiquitous nature of the smartphone and its capabilities cannot beunderestimated. We’re seeing that as the younger generation enters theworkforce, how they’re using these devices is really progressing at analarming rate and I think that trend will continue,” Audette says. Two stalwarts of home-based technology delivered through paid monthlysubscriptions, landline phones and TV service,are also on the decline as consumers come to expect free access tocontent they can consume anywhere. Although 75 per cent of Canadians say it’s still important to have alandline, 25 per cent of them have already dumped their landline andanother 17 per cent plan to drop it within the next year and only usetheir mobile phone. As for TV, 13 per cent of Canadians currently have no paid TV subscription and 10 per cent of those who do subscribe plan to canceltheir service within the next 12 months. That meshes with the study’sglobal data that points toward a migration from TV to online video consumption: 60 percent of consumers say they’re happy with the quality of video content they receive on the Internet, a sharp jump from just 35 per cent in2010. Canadian service providers are already adapting to these trends,Audette says, with all major landline phone companies competing in themobile phone market and many cable or satellite TV providers offeringstreamed TV content on the Web or mobile devices. “It’s about adapting their business models to try to take advantage ofthat trend. Some are (already doing that). And there’s also some prettyrich (TV) content from some of the TV (broadcasters) themselves,”Audette says. For example, Canadian private broadcaster CTV (a division of BellMedia) launched CTV Mobile in September, allowing mobile users to viewup to 150 hours of TV content originating from the main CTV channel andits sister station CTV Two. Besides TV content, Canadians are growing more reluctant to pay for anycontent on the Web at all. Only two per cent of Canadians are willingto pay for full access to a Web site, down sharply from 16 per cent in2010. And 82 per cent of Canadians say they currently do not pay forany online content they access. Consumers are coming to expect free access to mobile content as well.Although 88 per cent of Canadians have downloaded a mobile app, 61 per cent did notpay for any of them. The expectation of free content access meanscontent providers and other businesses must use new technology tools tomarket their wares in a more targeted way rather than simplycharging for access, Audette says. The strategy might work here in Canada, since half of Canadianssurveyed are willing to have their online usage tracked by advertisers, especiallywhen tracking provides a payoff like promotional offers or discounts.